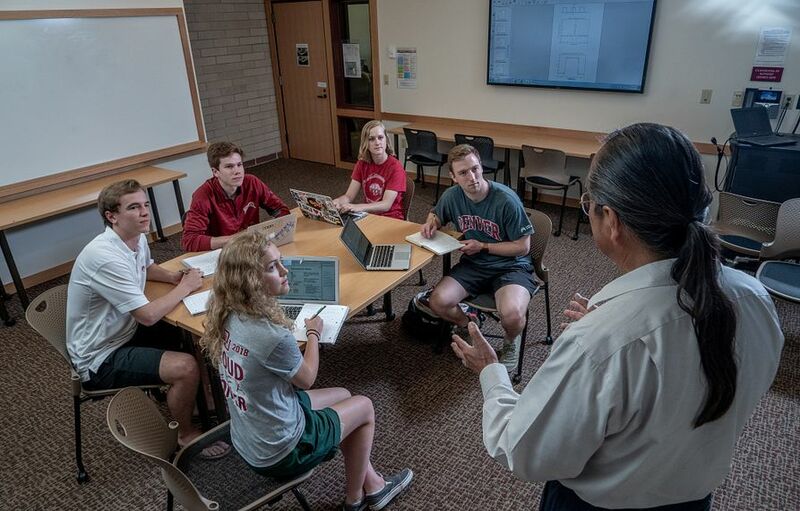 At the University of Denver, we believe in a holistic review of our applicants. A full review of submitted application materials – focusing especially on the high school record – is key to knowing a student’s preparedness and academic abilities over time. We believe in diving deep into your life experiences, your passions and your engagement within the community. Our process also recognizes the value of standardized tests as a piece of the review process. An ACT or SAT score can provide useful information which we will consider alongside the other required application materials. However, we know there are times when students may feel that an ACT or SAT score does not accurately represent their academic abilities. There is sufficient evidence that standardized testing does not reflect the true academic capacities of some individuals. Beginning with students applying for the fall of 2020, we have made the decision to adopt a test-optional policy. We encourage you to take the SAT and/or ACT standardized tests. Once you receive your results, if you think your scores are an accurate representation of your ability, please send them our way. We will consider these scores along with all other materials in your application file – staying consistent with our holistic review process. If you ultimately decide your test scores do not represent your abilities and potential, feel free to choose our test-optional process. We will then evaluate your application without considering this information, while maintaining a holistic review process. If you would like to further explore if this option could be the right fit for you, please feel free to contact your admission counselor. How do we evaluate students who do not submit standardized test scores? We will review all other required materials including your Common Application or Pioneer Application, essay, official high school transcript, and counselor recommendation. We will closely evaluate your high school work – curriculum, trends in grades and how you have challenged yourself. We will delve into your involvement in high school – extracurricular activities, leadership and community engagement. Your counselor recommendation will also help us understand you in the context of your school and how you have performed overall. No. There will be no negative impact on your application, and you will be considered for merit scholarships. Why would a student submit standardized test scores if they don’t have to? For some students, their test scores accurately reflect their academic abilities and might even give a more complete picture of achievement and potential. Will I be eligible for merit scholarships if I apply test-optional? Yes, all applicants are eligible for merit awards. Our top awards are very competitive, but all applicants, with or without standardized testing, will be considered for merit scholarships. Notification regarding merit aid is included in the admission decision letter. Applicants who are homeschooled or attending non-graded schools are required to submit official ACT or SAT scores. Prospective NCAA Division I student-athletes are required to submit standardized (ACT/SAT) test scores to the NCAA Eligibility Center for NCAA initial-eligibility purposes. However, prospective student-athletes may choose to apply for admission to DU as test optional applicants. Applicants who would like to be considered for the 6-Year Bachelor/JD Program are required to submit official ACT or SAT scores. International applicants who are non-native English speakers must submit an acceptable score on either the IELTS (International English Language Testing System), TOEFL (Test of English as a Foreign Language) or CAE (Cambridge English: Advanced) to be admitted into a degree program. Those admitted conditionally (without proof of English proficiency) must submit sufficient scores by July 1. After this date, students will begin their studies at the English Language Center before enrolling in their degree programs. Details on English proficiency requirements and exemptions for international applicants can be found here.